This method is used to register a protocol name with a a functor that creates the service. This method connects to a service by name. This class is the base class for the service classes. The services map a string to a chain factory with a known interface at the front of the chain. So, to activate a service, call activate() with the name of the service needed which will call the associated factory, and return a pointer to the known interface. NOTE: If you are implementing a service factory, it is vitally important that the service pipe is at the front of the chain. Definition at line 119 of file llservice.h. Definition at line 124 of file llservice.h. Definition at line 159 of file llservice.h. Definition at line 38 of file llservice.cpp. Definition at line 42 of file llservice.cpp. name The name of the service to connect to. chain The constructed chain including the service instance. context Context for the activation. An instance of the service for use or NULL on failure. Definition at line 65 of file llservice.cpp. References llendl, llinfos, llwarns, NULL, and sCreatorFunctors. name The name of the service to discard. true if service creator was found and discarded. 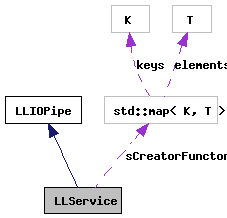 Definition at line 101 of file llservice.cpp. aParameter A brief description of aParameter. Returns true if a service was successfully registered. Definition at line 47 of file llservice.cpp. References llendl, llinfos, and sCreatorFunctors. Definition at line 186 of file llservice.h. Definition at line 160 of file llservice.h. Referenced by activate(), discard(), and registerCreator().